This photograph shows some of the first panmen playing biscuit tins with sticks. (second from right) tuning some of the first pans. There appeared on the Internet recently an article on Ellie Mannette titled "Persistence of Trinidad native pans out", in which the view is held that the development of pan was purely his, and only his, doing, and how the society of T&T conspired to "scorn" him, "ridicule" him, and even "destroy" him and the instrument. The article even said that "Mannette, married twice, was deserted by both wives in his time of need", having been encouraged to do so by their respective families. Rather foolishly, the author of the piece went along with Mannette's trumpeting of his own self-importance at the expense of objective research which would surely have placed all Ellie's claims of persecution in the proper context of all art forms emanating from below, from the grassroots. Everyone involved in the pan development movement, and a "movement" it surely was, felt the social pressure that was brought to bear by the upper-class elites and their established authorities. Nevertheless there is the dichotomy that had it not been for certain elements of the very upper-class citizenry, neither "pan" nor "calypso" may have survived. Furthermore, Ellie Mannette left T&T in 1967, by which time pan had already experienced its most "golden era" of widespread experimental development and social acceptance. The steel orchestra had already been fleshed out; Crossfire had already rolled on wheels setting off a host of new engineering feats; the "Bombs" (classics in calypso tempo), a Neville Jules/AllStars invention, were already dropping on J'Ouvert mornings with intense rivalry between All Stars and Ellie Mannette's band, Invaders, much to the joy and tingling pleasure of tens of thousands. Anthony Williams had already placed on the agenda the "spider-web" tenor with the 4ths and 5ths placement of notes; Ray Holman, a grammar school boy, a mere teen, had already composed for pan a tune called "Ray Saga"; Kim Loy Wong had already did his bit in Mango Rose and gone abroad, as did Curtis Pierre and the Dixieland band; Bertie Marshall had already sunk the concave pan even deeper and canopied the instruments, as well as experimented with amplification, first with the bases of City Symphony and later the tenors of Highlanders; corporate citizens were already exhorted by official decree to comply with the legitimate socio-political agenda of sponsorship of steelbands; and most of all, T&T had already become the leading country in the world in regard to ratio of practising musicians to total population only because of the steelband movement. How intellectually dishonest and anachronistic is it for Ellie Mannette to tell the world in 1999 that "Trinidad was not there for him" and that as a result that he is still "bitter", after all the encomiums and accolades heaped on Ellie's band, Invaders, for so many Jouvert mornings, from "Beautiful Dreamer" to "In a Monastery Garden". And Ellie says this in the USA whose history of jazz and blues' music is almost identical to that of our pan and calypso. But we must take great offence to the author's claim that Ellie Mannette "is credited with developing seven of the "voices" or instruments in a 10-piece steel-drum band". Nothing appears further from the truth, except possibly the claim that Spree Simon invented the pan. Spree bought his first tenor pan from Neville Jules for one shilling. The only bit of truth on pan history in the article on Ellie Mannette came when the author stated: "Other island youth had discovered years before that indentations on convex metal surfaces produced different sounds", and thereafter "fierce rivalries" ensued. That reference can only be alluding to the Hell Yard band in which Neville Jules and company experimented at first with the biscuit drum beaten into a convex shape. This is clearly substantiated by Kitchener's first steelband calypso of the early 40s in which there is no mention of Spree, but he calls all the top names out of Hell Yard, some of whom would leave shortly after to help form Casablanca, taking the "Cross of Lorraine" French-Sailor symbol with them. In 1985 a banner was put up, over and across, the All Stars panyard on Duke Street. The banner stated boldly: "Trinidad All Stars 50 years old 1935-1985". There was no explanation, no documentation or PR releases to justify that bold acclaim. We advised that to put up such a banner without any historical documentation was tantamount to being quietly arrogant. A widely held view is that pan appeared in the '40s, moreso after the war. All Stars disputes this by claiming to have had "pan" amidst their tamboo-bamboo "Bad Behaviour" aggregation as early as 1935, before the war. We suspect that pan only became part of the general Trinidadian consciousness after the war. The point is that without substantiated historic documentation, anyone, even someone like Spree Simon or Ellie Mannette, could be free to exaggerate their own importance to the development process and be fanciful in their attempt to boost their own self-aggrandisement. Unlike the Japanese and Americans we seem culturally to disdain documentation. What is the reality? What more or less is common knowledge? Ellie Mannette is credited with discovering the concave tenor pan, and for a while, was regarded as possibly the finest tuner around, given his personal experience with metallurgy, until the likes of Marshall, Wallace, Baseman, Coker, Alan Gervais etc came along. Neville Jules concedes to the crediting of Mannette as the concave pan discoverer but he maintains that by the time he heard about Ellie's experiments he was already doing so himself. 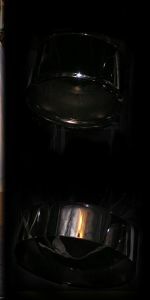 Neville Jules was the man who consciously searched for the full, complete steel orchestra. He fleshed it out. He experimented with the "Grundig" and "cuatro" pans, forerunners to the second pan and the guitar-pan, he did high bases (forerunner to "cellos") and low bases. In fact, he always maintained that what we popularly call "second-pan" is really the authentic tenor voice, and what we call "tenor pan" is really a "soprano-voiced" pan. It was he who maintained that Panorama could not be fairly judged until "standardised" pans are placed on stage and pannists walk on, beat, and walk off. We are yet to come to terms with the measure of this man, Neville Jules, whom deceased Sonny Denner, one of T&T's foremost traditional musicians, claimed, has "the sharpest musical hearing ever". "Double-tenors" and "cellos" were also gifts of Bertie Marshall to the process, in addition to what we have already credited to him. "Nine" and "twelve" bases came from Rudolph Charles. "Quadraphonics", probably the most authentic voice of all, was the result of collaboration between Charles and Marshall. And to Tony Williams we shall give the last say because his "4ths and 5ths" tenor pan in fact, after all is said and done over the past 30 years, is already destined to be the standardised tenor of the new millennium. 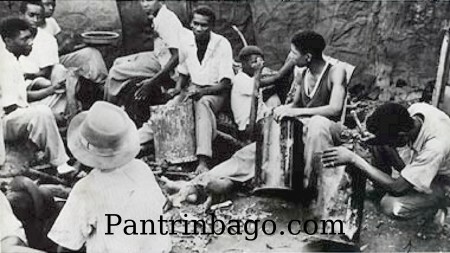 Deceased Lennox Pierre, lawyer and music enthusiast who was there from the very early beginnings of the process, and who worked with TASPO before their departure to Britain, told us that the tenor men then held the pan on their laps with one hand and played with the free hand until one, Villaroel, from the Tunapuna/Tacarigua area came and exhibited to them the use of straps around the neck and the two-sticks dexterity that this facilitated. The point we wish to make was that experimentation was fast and furious and when someone came up with something that made sense, within days, everyone was on to it. And it was widespread, almost nationwide, moreso as many of the pioneers and virtuoso-players, who were by far greater in numbers than the pioneers and would necessitate a separate article, usually ran foul of the police and legal authorities and had to flee to all parts of the island where they helped to establish new bands and continued their experimentation with the sounds of steel. The lies and distortions associated with the Ellie Mannette article should motivate us and the State authorities to commit ourselves to a definitive documentation of the history of pan development. We have before us an indigenous body of instruments that have broadened the musical family of the world and is a billion dollar industry begging to be embraced and realised. Malik, the Bad Poet, when jailed in 1970, was inspired to write a poem on pan by a drawing he saw on the walls of a particular cell; some unknown, previously-incarcerated, soul had drawn a woman giving birth, not to a child, but to a tenor pan. Indeed, what a sociological, psychological and political statement! "T&T is the land of pan and calypso, that is not a fast food slogan," says Mudada. Maybe we shall wake up one day. Ellie Mannette got his award and recognition from the highest US authorities for his life's work with our so-called national instrument, but that has not elicited a single murmur from our powers that be. We say again that we must come to realise that any political party without a firm policy on pan and calypso, our foremost identity to the world, should be chased altogether from the arena. This surely is not the last word.